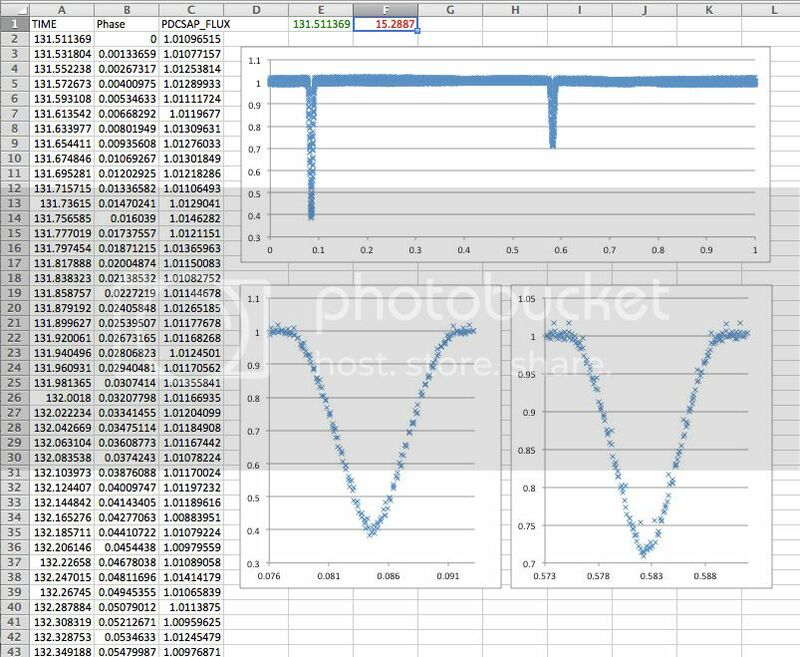 I've been asked this a few times, how to generate good phased curves, and the usual answer is to go to NEA's excellent periodogram service which will find the periods and plot those phased (or folded) curves that you all know and love. However I've realized that the service isn't perfect. It is sometimes hard to get the precise fold at the correct period. Even trying out various algorithms such as the BLS or the Plavchan, you may still end up with an imperfect period. It will generally get you close to the actual period, but to do better, you can actually use a spreadsheet like Excel to improve on it. I will use this light curve, SPH10144580 or kic 4678171, which is a rather nice eclipsing binary, to illustrate this. To start with, you will need the light curve in a format that Excel can understand, and this is the CSV format. It simply consists of two columns, the time and the flux. To get this, you do one of several things. 1. Download it from the PlanetHunter Examine Star page. The CSV by this method needs to be processed further as it contains repeats and some quarters may be missing. 2. Or you can ftp the FITS file from MAST and use a tool like TOPCAT to read it and convert it to CSV, and strip off the unneeded columns. Note to PlanetHunters - it might be good to reformat your CSV files so that the bulk of it is just an uninterrupted series of TIME and FLUX data. Metadata and how quarters are segmented can be put in a header. This way the meta information can be deleted, leaving the data required for further processing. It is actually not helpful to have the quarter breaks and duplications in the CSV because they need to be reconciled and deleted, adding more complexity. Download it from the PlanetHunter Examine Star page. The CSV by this method needs to be processed further as it contains repeats and some quarters may be missing. Or you can ftp the FITS file from MAST and use a tool like TOPCAT to read it and convert it to CSV, and strip off the unneeded columns. Open the CSV file in Excel (or some other spreadsheet if you have ideological differences with Microsoft). Insert a column in between Time and Flux and call it Phase. Copy the 1st value of Time (in cell A2) and paste it in cell E1. You can also name this cell, 'start'. In cell F1, paste the period you want to refine. If you used the NEA service, the Plavchan approximation for the period is 15.255. Name this cell, 'period'. In cell B2, the first cell of the Phase column, enter the formula, =MOD(((A2-$E$1)/$F$1),1). Now select this entire column from B2 right to the end and fill down, populating the entire column with this formula. Now select the Phase and Flux columns and Insert a chart (marked scatter) with Phase in the X column and Flux in the Y column. Then duplicate this chart twice, and change the scales so that these two charts focus on the primary and secondary eclipses. This screen shot is what you should have. 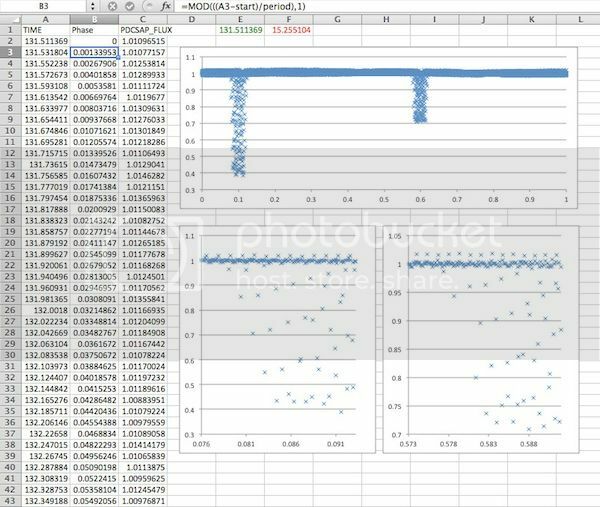 It's clear that the period isn't all that great, but now that you have this spreadsheet set up, you can tweak the period to get the best fold by eye. Nice! I teach Excel for a living and call myself a guru, but this is slick. Like they say, when it's time to meet your guru, he will appear! Paul, I was wondering if you know how to add little buttons to the spreadsheet so that you can click to increment or decrement the period by a small amount, say, 0.001, which can be entered in another cell. This would be really cool. - Use the Insert button on it. - Move on to the spreadsheet where you want the spinner to appear and click and drag to draw it. I often put them out in the open somewhere and make them bigger than I need just because that's easier to edit first, then resize and move into place once I'm done. - Check that your Design Mode button on the Developer tab has turned on (it should have, but turn it on yourself if it hasn't). - Right-click your new spinner and select Properties. This will display the Properties sheet for the spinner. - Upper boundary goes in the Max field, say 500,000 so you can go to +500 days. No commas when you type in this field, please! - Lower boundary goes in the Min field. Thankfully, unlike older versions of Excel you can put a negative in here. Say -500,000 (again, no commas when you enter it). - The last thing to do is get the spinner to drop its value in a cell somewhere (formulas can't access controls directly, they have to read from a cell). In the Linked Cell field, type the cell reference where you want the number to go. Using your screen shots above, this would be F1. You may actually want to drop it someplace else (say G1), then change F1's formula to read =G1/1000 to compensate for the "integer problem" above. Easier than fixing it in your slick little MOD formula. - Turn off the Design Mode button on the Developer toolbar and the spinner will go live, at which point you can click the up and down arrows, and the number should change. Let me know how that works for you and I can walk you through any tricky bits, or refine it to act differently if needed. Or if you're using Excel 2003 or earlier, let me know and I'll post the different instructions (it's mostly the same once you've figured out where the Active X controls are hiding in the older versions and get it drawn onto the sheet). Use the Insert button on it. Move on to the spreadsheet where you want the spinner to appear and click and drag to draw it. I often put them out in the open somewhere and make them bigger than I need just because that's easier to edit first, then resize and move into place once I'm done. Check that your Design Mode button on the Developer tab has turned on (it should have, but turn it on yourself if it hasn't). Right-click your new spinner and select Properties. This will display the Properties sheet for the spinner. Upper boundary goes in the Max field, say 500,000 so you can go to +500 days. No commas when you type in this field, please! Lower boundary goes in the Min field. Thankfully, unlike older versions of Excel you can put a negative in here. Say -500,000 (again, no commas when you enter it). The last thing to do is get the spinner to drop its value in a cell somewhere (formulas can't access controls directly, they have to read from a cell). In the Linked Cell field, type the cell reference where you want the number to go. Using your screen shots above, this would be F1. You may actually want to drop it someplace else (say G1), then change F1's formula to read =G1/1000 to compensate for the "integer problem" above. Easier than fixing it in your slick little MOD formula. Turn off the Design Mode button on the Developer toolbar and the spinner will go live, at which point you can click the up and down arrows, and the number should change. Does this also work with non-EB configs? Say for relatively smaller planets? Also, I already downloaded the zip file for Windows but haven't a clue on what to do with it. Do I just extract it and let it work itself or what? > Does this also work with non-EB configs? Say for relatively smaller planets? > Also, I already downloaded the zip file for Windows but haven't a clue on what to do with it. Do I just extract it and let it work itself or what? Yes, it definitely works on anything that's periodic and you want to fold the curve to see this periodicity. As Paul said, you'll also need python. There are instructions on the README.txt on this too. There are 2 main versions of Python - 3 and 2 (latest is 2.7). Make sure you have 2.5 to 2.7. There is a bug that I overlooked in the version that is on the server. The files kfits, detrend, getfits all need to have  a  .py added to the end of them so that the Python interpreter knows they are python scripts. There is a bug that I overlooked in the version that is on the server. The files kfits, detrend, getfits all need to have a .py added to the end of them so that the Python interpreter knows they are python scripts. meaning in english : incorrect syntax on the file name or directory. It does not like the "*"
If I give the full name (only one file) it works. Did you have this problem ?